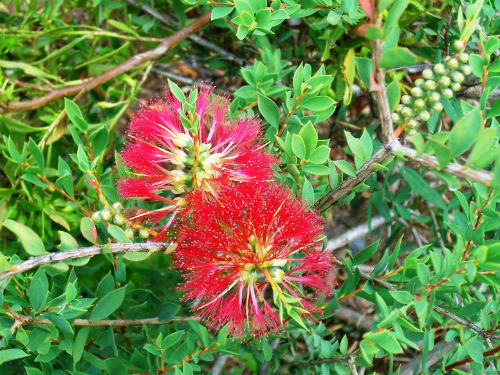 Melaleuca macronychia is a medium-sized shrub that will reach a height of 3 metres with many branches. Leaves are lanceolate, blue-green and up to 4 centimetres long. The striking flowers are held in large, cylindrical spikes, up to 6 cm long, bright red and carried on short lateral branches. Flowering begins in summer and continues for many months. Remove the spent brushes. The blue-green foliage contrasts with the flowers. Blooms are followed by clusters of sperical capsules that bunch along the branches. M. macronychia is an eye-catching plant with its red bottlebrush-like spikes and would enhance a native garden bed. M. macronychia comes from inland areas near Coolgardie and north of Esperance, Western Australia. The species name is from the Greek, macros meaning large and onyx meaning a claw. This refers to the way the staminal bundles curl. M. macronychia is one of a number of Western Australia species with great horticultural potential.